The Nazis experimented with transporting German Jews ‘east’ to their certain death soon after WWII began. In February 1940, over 1000 German Jews were deported over 900 km south from Stettin to villages near Lublin in occupied Poland; one of these was Bełżyce. A year later, five transports of 500 Jews from Vienna moved east. But the June 1941 launch of Operation Barbarossa — the attempt to conquer Russia — marked a turning point in the Nazis’ strategy of using the ‘east’ to solve the alleged Jewish “problem” within Germany. Forced emigration elsewhere (but frequently to refuges of safety) was to be tolerated no longer and forced migration — or ‘resettlement’ as it was called — within the Third Reich was deemed the most satisfying solution. In July 1941, Göring assigned Heydrich the task of drafting a plan. Hitler promised his inner circle that as soon as the war with Russia was over — expected before the first snowfall mid-October 1941 — the German Jews would be removed to the east. The initial plan was to move the German Jews to locations where ghettos already existed; here, they might die of starvation, disease and/or work while a more long-term solution was devised. Change was swift: on 1 October 1941, there were still 163,696 Jews in Germany. Three months later, 131,828 remained. The precipitate drop came almost exclusively through deportation (although there was a significant increase in suicides). On 14 October 1941, the first order for deportation of German Jews was given; each transport was to include 1,000 people, if not more; the first transports were to focus on large cities, particularly Berlin, where the largest number of Jews — including a dozen Themarens — lived in 1941. On 18 October 1941, one thousand Jews were transported from Berlin 460 km east to the ghetto in Lodz, called Litzmannstadt by the Germans. On 23 October 1941, any further emigration out of Germany was formally prohibited. By 1 November 1941, this first wave of deportations was complete: over 10,000 German Jews had been transported to Lodz, primarily from the large cities such as of Berlin, Frankfurt, Hamburg, Düsseldorf, and Cologne. 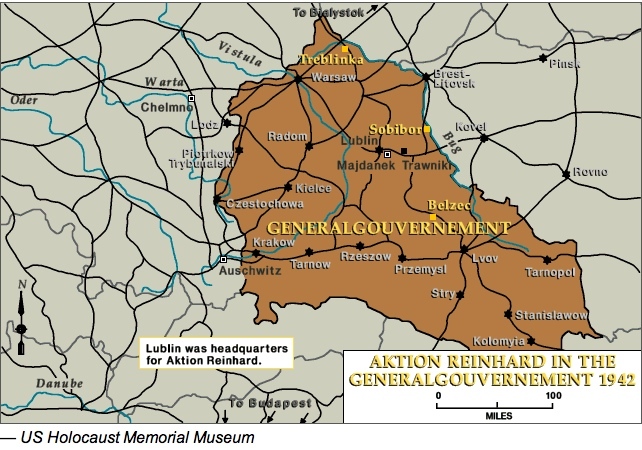 The primary intent of Operation Reinhard was the murder, through gas, of the two million Jews of the General-gouvernement region of occupied Poland. But by spring 1942, when Belzec started to gas Polish Jews, it was easily predictable that German Jews being transported east to the Generalgovernement region, would meet the same fate. Any promise of “resettlement” was a snare and a delusion. Planning for the deportation of Thüringen Jews began in November 1941 when the Finance Ministry sent a memo to regional authorities, informing that “all Jews not employed in essential jobs are to be deported to places in the east in the coming months. They may take with them 100 RM and 50 kg. in one piece of luggage.” Jews over 65 years of age were later exempted from the May 1942 deportation after the decision to deport them to the ghetto Theresienstadt was made. The first deportation was originally scheduled for April 14, 1942 but was subsequently rescheduled for May 10, 1942. On 30 April 1942, the authorities informed the Jewish Association of its role and duties in organizing the transport. On 4 May 1942, mayors received detailed instructions about the roundup of Jews in their individual municipalities; the mayors passed the orders on to the Jewish men and women: they were to pack one piece of luggage weighing 50 kg. and send it on ahead to Weimar by May 7th; their hair was to be cut; they were to buy train tickets for the journey in advance; and they were to be “in a clean condition” for the journey. On the 8th or 9th of May 1942, 342 Thüringen Jews were transported in ordinary passenger trains from their towns and villages to Weimar. They each carried with them 100 RM (Reichsmark) and one piece of hand luggage containing food for 3-4 days, eating utensils, 1 blanket, 1 cushion and 1 towel. Everything else became property of the Reich, courtesy of the Eleventh Decree of the Reich Citizenship Law. 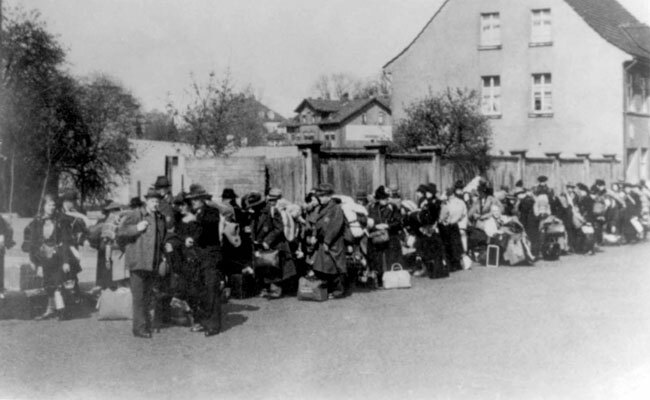 The roundup took place in full daylight and in Eisenach, at least twenty official photographs, including the one below, documented the 53 Jews being herded toward the railway station where the train left for Weimar at 11.00 a.m. (see this link). May 9, 1942. Deportation of Jews from Eisenach, Germany. Credit: Yad Vashem The Holocaust Martyrs’ and Heroes’ Remembrance Authority 2012. The assembly place for the deportees was Weimar’s stock pen. Armed SA men guarded the entrance. Had the Nazis chosen this place to further humiliate us, to equate Jews with animals? The sour smell of fear mixed with cow dung and straw was overpowering. More and more people arrived carrying suitcases. Old and young, they lined up to have their papers examined. I had never been in a stock pen before. Along the wall were individual stalls designed to hold animals, and to the side stood a large scale. Beyond that were the railroad tracks. Sometime between midnight and dawn on 10 May 1942, 513 men, women and children were loaded into cattle cars and transported to Leipzig (‘B’ on map below) where 287 people joined the transport; then it was on to Chemnitz (‘C’ on map below) where 199 more people were herded onto the train. An eyewitness remembered that as the train left the Chemnitz railway station at 10.45 p.m., it consisted more of people than of train cars. The exact destination was unknown until the last minute: in the initial plans, the destination of Train ‘Da 72’, the train to carry the Thüringen Jews, was the all-purpose “Trawniki,” a synonym for ‘east,’ near Lublin. It then became Izbica, a ghetto about 90 km southeast of Bełżyce. But just as the train left, the destination was finalized as Bełżyce. The transport travelled 1050 km to Lublin, arriving on 12 May 12 1942. Then, because Bełżyce had no railway connection to Lublin, the men, women, and children had to walk at least 4-5 hours to reach Bełżyce, 24 km. to the west of Lublin. 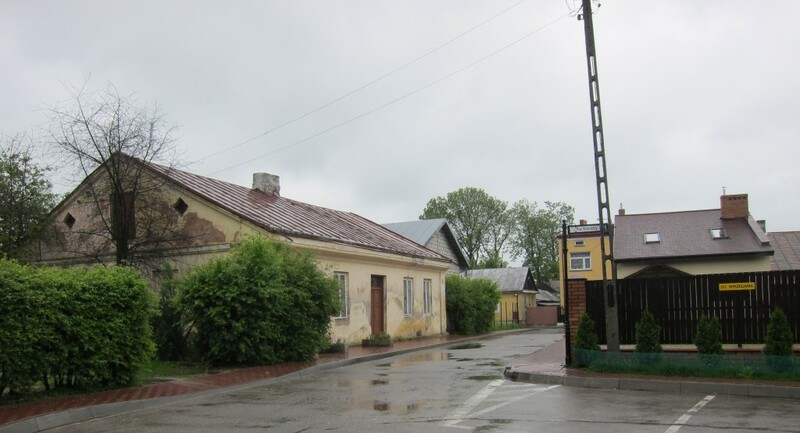 In spring 1942, about 4000 Jews lived in Bełżyce, a combination of pre-WWII Polish residents, forced migrants from Lublin and small villages near Bełżyce, and the 1000 German Jews of Stettin, who had been deported ‘east’ in February 1940. 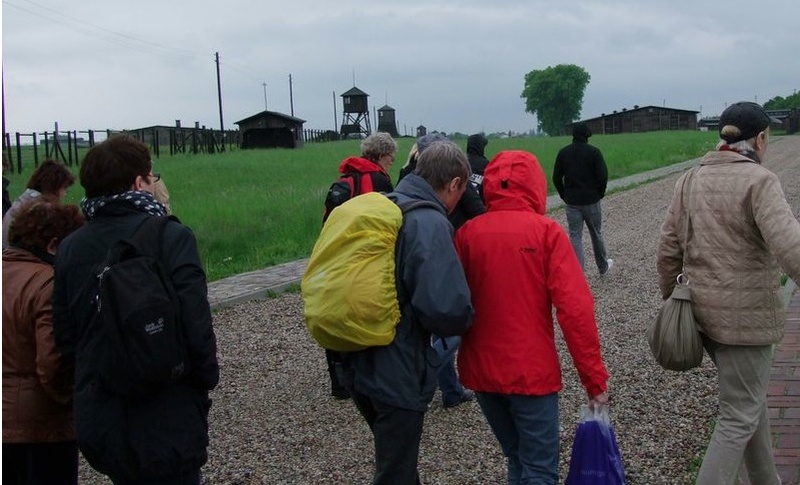 The ghetto was full to overflowing and, on 11 May 1942, Polish and Stettin Jews were taken to Majdanek in order to make room for the newcomers. The Nazis thus had a full range of possibilities to murder the inmates of the Bełżyce Ghetto: murder by bullets in the ghetto; starvation and/or disease in the ghetto; work or gas in Majdanek, a combination killing centre/concentration camp, right in the suburbs of Lublin. Or they could send the Jews to Sobibor, 90 km to the east, when it began operations in September 1942. Carsten Liesenberg and Harry Stein tell us of three major ‘Aktions’ — that is, killing sprees — against the Jews in Bełżyce. First, on 2 October 1942, SS men with Ukranian assistants murdered 150 male Jews, many of them from Thüringen, in front of the synagogue. On 13 October 1942, a second ‘Aktion’ took place and thousands were murdered, either in the town itself or in a killing centre (Majdanek or Sobibor). 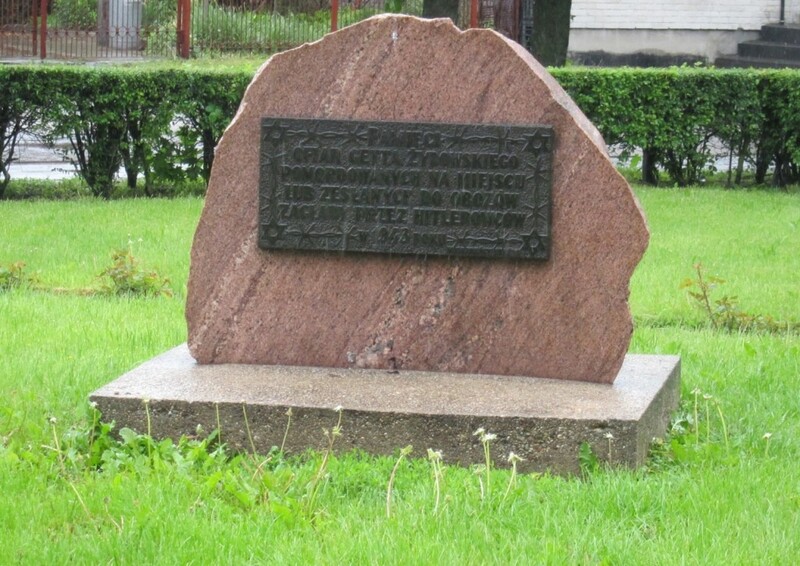 Bełżyce became a work camp until May 1943, when the third ‘Aktion’ took place, the murder of 850 to 1000 Jews, mostly women and children, in the Jewish cemetery outside of the town. The 500 surivors were taken to the work camps at Budzyn and Krasnik. 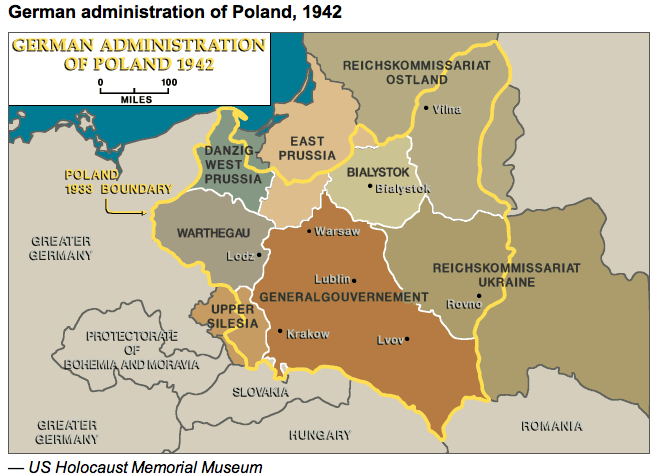 After May 1943 there were no Jews in Bełżyce. By the end of 1943, there were few, if any Jews in the entire Lublin district — the murderous rampage of ‘Aktion Reinhard’ had taken the lives of 1.7 million Jews. The May 1942 deportation to Bełżyce has been a largely unknown transport. There were five survivors of the transport; one of these was from Thüringen, Laura Hillman, born Hannelore Wolf. 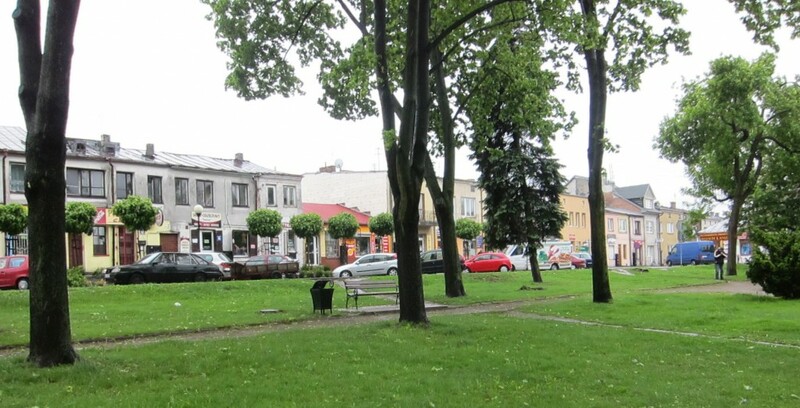 In her 2005 memoir, I will Plant You a Lilac Tree, Hillman describes the deportation of herself, her mother, and two brothers from the day she received notification from her mother until the family arrived in Bełżyce. She was in Berlin at school when her mother wrote telling her that she had received the letter of notification. Hannelore insisted on joining her mother and two brothers in Weimar and leaving Germany. She was the only one of the four to survive. Her memoir is valuable, although most of the discussion concerns the post-Bełżyce experiences. Bełżyce also escapes notice because the May 1942 deportation was the only one to this ghetto in the period after the January 1942 Wannsee Conference. More and more, the Nazis simply sent German Jews directly to the killing centres without a transit stop in a ghetto. Given the similarity in names and proximity in location, Bełżyce is often, and easily, confused with the Belzec killing centre. For example, the Anne Frank website that displays the photographs of the Eisenach deportation mistakenly labels the photos as being of “deportation to Belzec.” Some of those in Bełżyce Ghetto may have been murdered in the Belzec killing centre but Bełżyce and Belzec are two different sites. Moreover, Leisenberg and Stein indicate that those sent from Bełżyce were sent to Sobibor. This statement on the annefrank.org website which posts the photographs of the Jews of Eisenach being deported on May 8th, 1942 illustrates the confusion between Bełżyce and Belzec. Thüringen Landeszentrale für politische Bildung, Studienreise/Study Trip participants at Majdanek concentration camp/killing centre, May 2012. Source: Majdanek State Museum. Yet there are some signs that the Bełżyce transport is receiving the attention it merits. 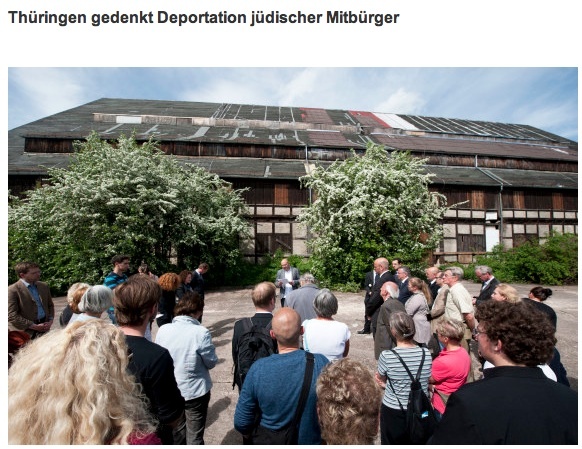 May 10, 2012 was the 70th anniversary of the deportation, and the Thüringen government and many of the cities and towns of Thüringen paid attention. In May, the Thüringen government sponsored an important one-week long study trip to Bełżyce and the surrounding Lublin region. (See the The State Museum of Majdanek’s item with photos.) As well, it published Deportation und Vernichtung der Thüringer Juden 1942, edited by Drs. Carsten Liesenberg and Harry Stein, a significant collection of documents. Commemorative events were held in various places and Stolpersteine for victims of the May 1942 deportation were laid in places such as Arnstadt and Eisenach with attendant public attention. Archival records, both public and private, are also providing insights: as with many other areas of Holocaust research, the opening of archives in the former DDR allows historians to examine the Thüringen records. The results can be seen in publications such as that of Liesenberg and Stein. Private records, such as the correspondence of the Müller family of Themar, lead us into the nightmare world of pain that individual families experienced in the years after 1941 and the closure of emigration. Bertram, Ellen. Menschen ohne Grabstein: Die aus Leipzig deportierten und ermordeten Juden. Leipzig, 2001, pp. 35-37. Das Bundesarchiv. Chronology of Deportations from the German Reich. 19th May 2011. “Deportation nach Bełżyce,” Exhibition 2009. Brunner, Reinhold. ,,Stolpersteine in Eisenach – Erinnerungen an das jüdische Leben und Sterben in der Wartburgstadt.” Eisenach, 2012. Dean, Martin. “The Development and Implementation of Nazi Denaturalization and Confiscation Policy up to the Eleventh Decree to the Reich Citizenship Law.” Holocaust & Genocide Studies, vol 16/no.2, pp. 217-242. Gibas, Monika. Ich kam als wohlhabender Mensch nach Erfurt und ging als ausgeplünderter Jude davon: Schicksale 1933-1945. Erfurt: LZT, 2008. Gottwaldt, Alfred u. Diane Schulle. Die ‘Judendeportationen’ aus dem Deutschen Reich: Eine kommentierte Chronologie, 1941-1945. Wiesbaden: Marix Verlag, 2005. Hillman, Laura. I Will Plant You A Lilac Tree. 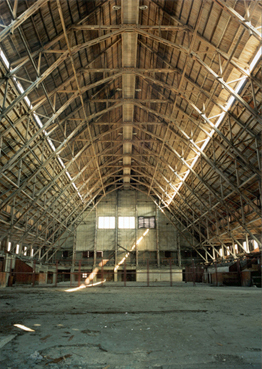 Atheneum, 2005. Liesenberg, Carsten. “Die Verfolgung und Vernichtung der Juden,” in Nationalsozialismus in Thüringen. Weimar Köln Wien: Böhlau Verlag, 1995. Liesenberg, Carsten u. Harry Stein, ed. Deportation und Vernichtung der Thüringen Juden. Erfurt: Landeszentrale für politische Bildung, 2012. Schröter, Manfred. Die Verfolgung der Nordhauser Juden 1933 bis 1945. 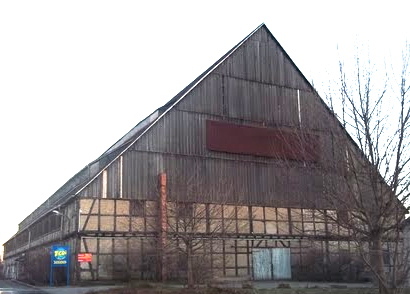 Bad Lauterberg im Harz: C. Kohlmann, 1992.